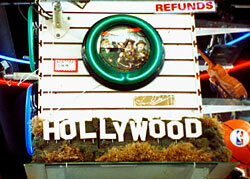 The Reality of Film; Thom Anderson on "Los Angeles Plays Itself"
A souvenir shop on Hollywood Boulevard, as seen in Thom Anderson’s “Los Angeles Plays Itself.” Photo by Deborah Stratman, courtesy of Film Forum. The best piece of film criticism I’ve encountered lately isn’t a book, newspaper, or magazine article. It’s “Los Angeles Plays Itself,” Thom Andersen‘s 169-minute documentary about how Los Angeles, “the most photographed city in the world,” has been depicted in cinema. The kind of masterpiece that expands one’s notions of what film can do, its closest peer is Jean-Luc Godard‘s “Histoire(s) du Cinema,” a densely poetic and allusive work that’s often been compared to James Joyce. Unlike “Histoire(s) du Cinema,” it’s quite accessible and paced better than the vast majority of action films. Early on, Andersen’s narration — spoken by fellow filmmaker Encke King — takes a swipe at the abbreviation of Los Angeles to “L.A.,” which he finds implicitly contemptuous. Some may scoff or find this concern petty, but this caveat is crucial to the film’s ethos. “Los Angeles Plays Itself” takes the unfashionable stance that cinema should have a direct, accurate relationship to reality. For Andersen, this is both an aesthetic and political position. Against a canon of “official” classics about Los Angeles — “Chinatown,” “Blade Runner,” “L.A. Confidential” — he celebrates films made by European “high tourists” and African-Americans. “Los Angeles Plays Itself” is powered by a fierce ambivalence, a love/hate relationship with cinema. Its intermingling of cultural and social history is erudite but unpretentious. If many of the best recent documentaries — “Bus 174,” “Capturing the Friedmans,” “Control Room” — show how our reality is contaminated by media, “Los Angeles Plays Itself” tries to grab control back by searching for truth within the image overload. Despite its length, it’s riveting viewing: lucid, funny, and inspiring. I haven’t seen a better new film so far this year. It opens at New York’s Film Forum on Wednesday. indieWIRE: The narration in “Los Angeles Plays Itself” is very personal. I was wondering why you had someone else do it rather than read it yourself. Thom Andersen: The guy who did it, Encke King, is an old friend of mine. He was a student at Cal Arts a long time ago, when I was first teaching there. I’ve always liked his voice. He knows me pretty well. I thought he could do a good job of playing me. I don’t like hearing the sound of my own voice. A lot of people are like that, maybe most. Especially when you’re editing narration and have to listen to someone talk constantly. It would have been a drag to edit my own voice. It’ll be different next time, if there is a next time. iW: You’ve made three documentaries in the past 30 years. Did you have other projects you were not able to complete? Andersen: When I was young, it was easier to make films. It wasn’t as expensive, there was more support. I found that I couldn’t get the money to make films. “Red Hollywood” was conceived 10 years before it was produced. We wanted to do it as a film but couldn’t raise the money, so we decided to do it as a cheap, crummy-looking video. When I thought about doing “Los Angeles Plays Itself,” I just assumed there would never be money to make it as a film. It’s also a cheap video. Doing things cheaper on video, which became possible in the ’90s, made it possible to make movies again. iW: All three of your documentaries touch on many subjects, but they also revolve around film. Was that a deliberate reflection of your interests? Andersen: I earn my living by teaching film, mostly filmmaking but also teaching courses on current cinema. I’m interested in movies. I hope that’s not all I’m interested in. In that sense, it’s maybe a little misleading. I don’t expect to make another movie about films, but I may continue to write about them. iW: Do you see your filmmaking as an extension of your teaching? Andersen: Yes. Basically it’s following the same method. In teaching, I like being able to present clips from movies on VHS or DVD and then talk about them. That’s what this movie is. It also happens that I don’t actually teach about the stuff I make things about. I’m not a film history teacher. In that way, it’s also a release. But the ideas that I talk about in the movie are the same I talk about in school. iW: You and Noel Burch wrote a book that covers pretty much the same ground as “Red Hollywood.” Had you thought about writing a book about the history of Los Angeles in film? Andersen: I hope I will. It’s a long movie, but there are obviously a lot of things I couldn’t talk about or would like to develop further. iW: Were you worried about the legal issues around using unlicensed film clips? When I first saw “Los Angeles Plays Itself” at the Walter Reade last winter, I assumed that because of them, it would never get a theatrical release. Andersen: I’ve talked with people about licensing everything. I think it might be an issue for television. I don’t know. We’ll see. I’ve been surprised that people who are part of the film industry like my movie and don’t seem to object to it. It might make fun of a few movies, but I think it does so in a fairly sympathetic way. I haven’t run into hostile responses yet. Maybe down the road I will. iW: How did the structure come to you? Did you select all the clips before writing the narration, or did you have a list of certain themes you wanted to discuss? Andersen: It started with the last part, then the first part. It starts out achronologically, but mostly with movies from the ’80s and ’90s. In the beginning, the structure is more geographical. In the second and third parts, it’s not explicitly chronological, but the movement basically is. The second part begins with “Double Indemnity,” which was made in 1944 and ends with films from the late ’60s. The third part begins with a film from the early ’70s and moves almost up to the present. At the end, it jumps back a bit. I think the structure is fairly natural and straightforward, although it’s basically intuitive. iW: Did you originally plan it to be longer or shorter? Did you have a rough cut that was five or six hours long? Andersen: I cut some things out, but not all that much. I wrote it first. It didn’t quite dawn on me how long it was going to be. When it turned out as long as it was, I could have cut out some more things. By that point, it didn’t matter very much whether it was 2 hours and 40 minutes or 2 hours and 20 minutes. To me, it’s sort of like a double feature. You see the first part, there’s an intermission and then you come back and see the last part. Their tone is different. It’s like seeing two movies. In that sense, I’d rather it be 2 hours and 49 minutes than 2 hours. If it could have been 80 or 90 minutes, I’d be happy, but that would have been a totally different movie. iW: Were there any subjects you wanted to address but didn’t have room for? Andersen: There are a lot of subjects I wish I could have addressed more fully, particularly in the third part. There might be certain things, which I should have felt obligated to address but didn’t, that people have pointed out to me, like the movies of David Lynch. I guess I just wasn’t inspired. I would have liked to talk about movies about the film industry. What I had to say about it was too complicated to say without making it a lot longer. iW: There’s one particular suburban space I was surprised not to see in your film: shopping malls. Are you uninterested in movies set in them? Andersen: That’s a good point. I think that’s probably a lack. The movie I regret most not including is “Fast Times At Ridgemont High,” which is one of my favorites. It may be the classic mall movie. So is “Jackie Brown,” in a way. I guess I have to admit to a failure there. I like malls, by the way. iW: In your director’s statement, you mention the philosopher Gilles Deleuze, but the film theorist “Los Angeles Plays Itself” reminded me of most was André Bazin. The section on Bunker Hill, in particular, reminded me of his ideas about film capturing reality. Was he an influence on your thinking? Andersen: He was a big influence on Deleuze. What’s most interesting about Deleuze’s books on movies is the way he extends Bazin’s ideas. For him, the key break that separates classic and modern cinema is neo-realism. His treatment of that begins by invoking Bazin and pointing out that his understanding of neo-realism represented a great step forward. In that sense, you’re absolutely right that Bazin is behind it. For me, the movie is a defense of the idea of realism and the tradition of neo-realist filmmaking, an attempt to suggest its relevance to filmmakers today. There are tremendously rich possibilities still available within it. iW: Were you afraid that the voice-over might sound a bit petty or overly cranky? Andersen: Not really. When I’ve made films like this before, they were in third person, so I was interested in the possibilities of the first person. I was inspired by the notion of the fake documentary and unreliable narrator. I thought I would write something more over-the-top and extreme, stuff that would be exaggerated or even false. I ended up writing stuff that I could stand behind. There’s nothing in it that, to me, is actually untrue, although some of it may seem, as you say, petty and cranky. Part of it is a kind of pedantic humor. It’s a little absurd in some of its contentions. For example, the thing about L.A. and Los Angeles, which has given me a lot of grief. It’s kind of hard to take seriously, but I think it’s always interesting to talk about the use of language. It reveals something that goes beyond the specific linguistic issues. I actually cut out a whole paragraph about the disappearance of the apostrophe in [the trolley] Angels Flight which would have been really cranky. I guess I have the idea that the disappearance or misuse of the apostrophe can tell us something about the times in which we live. The use of diminutives as a way of denigrating something is done unconsciously, but we should be conscious of it. I’m not against changes in language, but people should be conscious of the way theyuse language and the way it can express ideas that aren’t acknowledged or understood. iW: Do you think the cynicism you point out in “Chinatown” or “L.A. Confidential” is something imposed upon the audience? Or are the filmmakers, consciously or unconsciously, tapping into a zeitgeist of mistrust of politics? Andersen: That’s a big question. How do popular attitudes get formed? Do the movies just reflect it or inform it? Where does this particular idea come from? I don’t know if I can say anything too illuminating. People say that you can’t change people’s minds with a movie or book, but how do they get formed in the first place? They get formed by what we see and read. In a certain way, movies are ahead of their times. People make them and don’t really know if the audience will respond to them. Once in a while, they do. Let me approach it in another way. I was quite impressed by what Kieslowski said about his practice as a filmmaker, particularly in his early documentaries. For him, it was a matter of living in a society where the way things really were, which everyone knew, didn’t match the way things were described in official art of the dominant culture. He thought that if you describe things as they actually were — it could be something fairly minor, like the way a hospital worked — then it would become possible to acknowledge that reality and affect it. First, it was necessary to have some kind of description. I think that’s the way movies work. They describe something. Then people could acknowledge it and act upon it. Sometimes the descriptions are accurate. Sometimes they’re not. “Chinatown” describes something in a way that is partially correct but in other ways, mythologicaland misleading in a significant way. It’s based on a political defeatism that it perpetuates. So when people come to acknowledge the description “Chinatown” presents, it creates this false sense of reality that one has to struggle against in order to move forward. It’s one thing I’ve been criticized for. Don’t I recognize that movies are just pandering to people’s beliefs? I don’t think that’s the way it works. That’s not really taking movies seriously. It doesn’t make sense, because things wouldn’t change and movies wouldn’t matter. And they do. Not just to us, but to everybody. iW: Did your interest in modernist architecture precede the film? Andersen: Yes. As a kid, I liked Frank Lloyd Wright. I never really knew much about architecture but started getting interested in it in the ’90s. I realized that Los Angeles is actually pretty rich in its residential architecture. A lot of great architects practiced there. I came to realize that modern architecture had gotten a bad rap, in a way. One thing that struck me is the notion that it was somehow tremendously naive and overweening to think architecture can make life better. But it seems totally obvious to me that architecture can make life worse. I work in a horrible building, so I’m always conscious of the way it can affect our lives. A lot of the architects working in the modernist tradition had ideas that can still be useful. iW: In your press statement, you’ve also said that you hope “Los Angeles Plays Itself” will inspire other filmmakers. When I saw it, it occurred to me that a Canadian director really ought to make a film about how Vancouver and Toronto have been used to portray American cities. Do you know anyone who has been inspired by your film? Andersen: Not yet. For me, the main point is that reality is rich. We can respond to it more immediately and directly, in ways where there’s less displacement between representation and reality.